We are through the first quarter of the 2010-2011 season and the best word that I can find for the city teams is “interesting.” I haven’t seen a year quite like this ever. One team has an “incomplete” on their record according to the MHSAA, but it’s counted as a loss everywhere else. 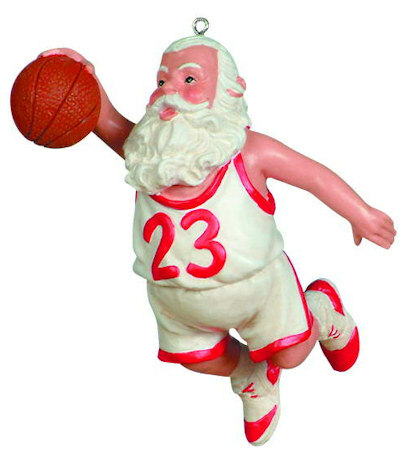 One team has a school full of kids and no ball-handlers. The final team had four legitimate college prospects that has mysteriously been reduced to three. Like I said, interesting. But, let’s dig into each team with a bit more detail…shall we? We will start with the favorite Northwestern Wildcats. FLINT, Michigan — The biggest matchup problem in MCCAA is not Doug Anderson or Jamie Stewart. Those players, to be sure, have given defenders fits all season and are arguably the top two JUCO players in the state. 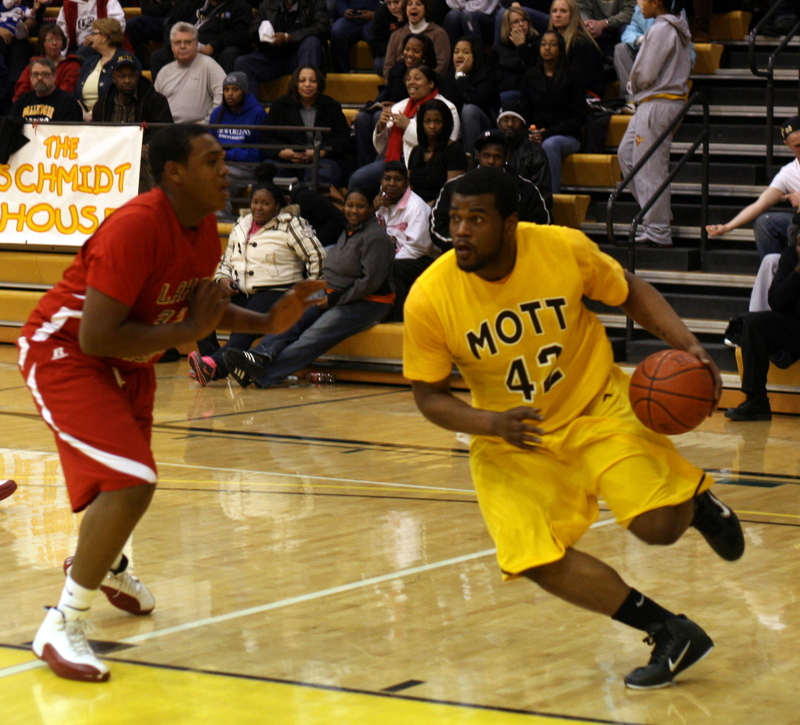 Enter sophomore transfer Leviante Davis, a part-time starter for Mott whose combination of size and athleticism is truly rare. Davis, at 6-4 and about 250+ pounds, is a nightmare to guard. He blows by forwards on the perimeter and manhandles taller bigs in the post. Last night in Mott’s 95-76 win over a hot-shooting Lake Michigan squad, Davis had 26 points with nine rebounds and four assists. He shot 9-for-14 from the field, right in line with his ridiculous field goal percentage — hovering between 60-70 percent all season. Flint, Michigan– The annual Coca-Cola Classic tournament hosted by Flint Northern was capped off by a Saginaw Valley clash between the host team and the highly-touted Saginaw Arthur Hill squad. All eyes were on the 6’9″ tree, Jordan Hare, and there were plenty of scouts on hand to prove it. The first quarter went back and forth with the Hill finishing with a 15-13 advantage. Shaquille Smith and Donald Fisher kept the Vikings in it, scoring six and five points respectively. Fisher even stepped out and knocked down a 3-pointer off of an inbound play. However, Hare’s length (at least a 7’0″ wingspan) gave Northern fits as he sliced through the heart of their 1-2-2 zone and finished at the rim. EAST LANSING, Michigan — Here are a few thought on some of the players from last night’s final two games at the Meijer Holiday Hoops Invitational. Dwaun Anderson, Suttons Bay: This is the player many waited all day to see, and boy did he disappoint. His performance on Tuesday night in a 30-point blowout loss to Saginaw Buena Vista was not unlike his two prior performances at the Breslin Center. Anderson scored 14 points on 16 shots and had his pocket picked by Buena Vista guard George Goodman twice. Last season, during the class C final four at the Breslin, the MSU-signee shot 12-for-38 from the floor in two games against Bridgman and Melvindale ABT. Based on what I’ve seen of his skill set up to this point, I think only the hardest of the die-hard MSU fans truly believes Anderson is ready for high-major basketball. His shot is still erratic (in three games at the Breslin he is 2-for-16 from 3-point range) and his ball handling is certainly not what you’d expect from a high-major shooting guard. Anderson is a high-major athlete, no one denies that, but I think many expected to see more of a finished product at this stage in his senior season. 4Q: Seniors Vince Adams and Pierre Brackett led the way for Powers in the Chargers’ 58-53 win. Okemos turned the ball over 10 times in the second half including several in crunch time. Mack McKearney led the way for Okemos with 15 points, 12 rebounds and four assists. Vince Adams, Powers’ leading scoring all season, once again had high-game honors with 18 points and four rebounds on 9-for 13 shooting. Patrick Lucas-Perry had 15 points on 5-for 17 shooting with three assists and three turnovers. Harrison-Docks had 19 points for Okemos, but three crucial turnovers in the final quarter. 3Q: Vince Adams leads all scorers with 16 points. He’s barely missed all game. Flint Powers and Okemos are tied going to the fourth. 2Q: Vince Adams (Powers) and Chris Harrison-Docks (Okemos) both have 10 points at the half. Okemos is leading 30-27. Powers’ junior Javontae Hawkins had a nice slam in transition, but otherwise has struggled mightily. 1Q: Powers’ Patrick Lucas-Perry and Javontae Hawkins struggle from the field in the first quarter. Okemos leads 15-9. Final: Saginaw Buena Vista, led by senior guard George Goodman’s 25 (and seven assists), dismantled Sutton Bay, 91-61. MSU-signee Dwaun Anderson finished with 16 points. BV’s senior shooter Derrick Washington added 20 for BV. 3Q: Saginaw BV leads 63-46 at the end of three quarters. Anderson drew his fourth foul midway through on an obvious over-the-back call. Goodman leads all scorers with 15. 2Q: MSU-signee Dwaun Anderson draws third foul with 5:35 left in the second quarter; Senior Derrick Washington swished a 3-pointer with .8 seconds left in the half to give BV a 37-32 lead. 1Q: Saginaw BV leads Suttons Bay 21-17 after the first quarter. BV’s George Goodman is leading all scorers with 10. Check back often for more updates. We will be courtside for tonight’s two showcase games: Saginaw BV vs. Sutton Bays and Okemos vs. Flint Powers. Even rabid MSU fans should acknowledge the humor in seeing the most recent AP Top 25 college basketball poll. 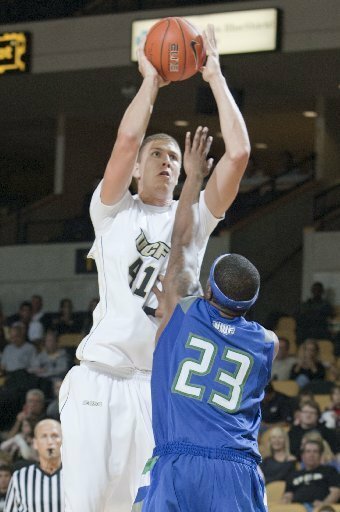 Former Flint Powers standout and former Spartan, Tom Herzog, has helped spur the University of Central Florida to a no.19 ranking, one slot ahead of his former team. Herzog, despite an early-season injury, is the team’s leading shotblocker and tied for second on the team in rebounding. For some who believed Herzog should have been given more of an opportunity to be a contributor at MSU, this is vindication. I think the jury’s still out on this one; it’s still too early in the season to really know much about his ability to be an impact player when given the opportunity. By way of comparison, both teams have one victory over a ranked team this season. MSU beat Washington (no longer ranked) and UCF beat Florida (no longer ranked). The showcase game of the 2010 Meijer Holiday Hoops Invitational will pit two of the state’s elite programs in their respective classes. Flint Powers will take on Okemos and its all division one backcourt at 8 p.m. at the Breslin Center in East Lansing. Guards Mack McKearney and Chris Harrison-Docks have led the Chieftans to huge victories already this season over Lansing Eastern and Lansing Catholic. Powers counters with senior wing Vince Adams, junior forward Javontae Hawkins and senior point guard Patrick Lucas-Perry. If this game came down to a battle of the backcourts, I’d give the edge to Okemos. Fortunately for Powers, their supporting cast is probably a little stronger. BTW: If you can get there early, the first game (11 a.m.) might end up being the best. Lansing Catholic, among the top teams in class B, will take on arguably the state’s best team in class C — Detroit Consortium. Every Flint Metro League coach struggles with the fact that the competition level inside the conference is never particularly good. Wins against conference teams often do little to prepare good metro teams for districts. One way of earning some respect and a few preparation points for the playoffs is to schedule good non-conference teams. Tonight, Fenton will take on a good, not great, Flint Southwestern sqaud at the Coca-Cola Classic at Flint Northern. The Knights gave Northwestern all it could handle last week, so they will be the favorites. One concern for the Tigers has to be Southwestern’s ability to match up against their high-scoring tandem of forwards, juniors Ryan and Dylan Hickoff. Senior point guard Eric Mowery will have to limit turnovers against the Knights who will likely put a lot of pressure on the perimter. He has been the starter at that spot since his sophomore season, so he should be up to the challenge. Southwestern will counter with seniors Marquez Poole and Kendrick Roberts along with junior Cory Jones in the middle. Roberts, a recent Western Michigan signee for football, is a poor man’s Tyrone Ward. He’s not as skilled as Ward, but he’s every bit the athlete. Southwestern is bigger (with the exception of Fenton’s 6-8 senior Charlie Herzog) and more athletic. We want to wish all our readers the merriest of merry Christmases this year. We hope you enjoy your time with family and friends today and throughout the rest of the holiday season. And while you’re at it, get out and watch some basketball. 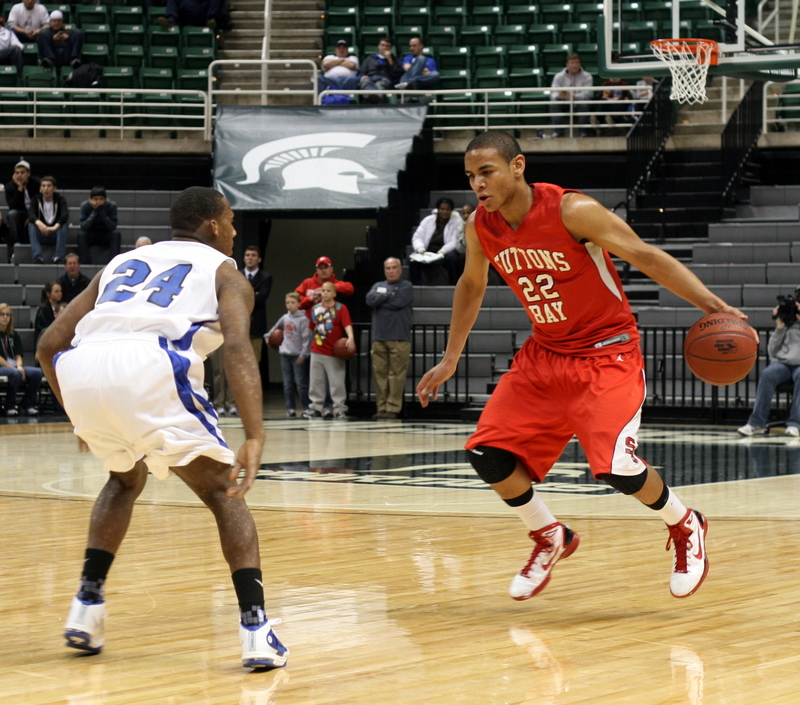 On Dec. 28, the annual Meijer Holiday Hoops Invitational will take place at the Breslin Center in East Lansing. This is always a fun event for a good cause. UNIVERSITY CENTER, Michigan — Up six at the half and 10 with six minutes left in the second half, an upset was brewing on Tuesday night at Delta College. The home Pioneers led most of the game, had numerous opportunities to put Henry Ford away and didn’t. They lost by one after a controversial foul with five seconds left in a tied game gave Henry Ford the lead. 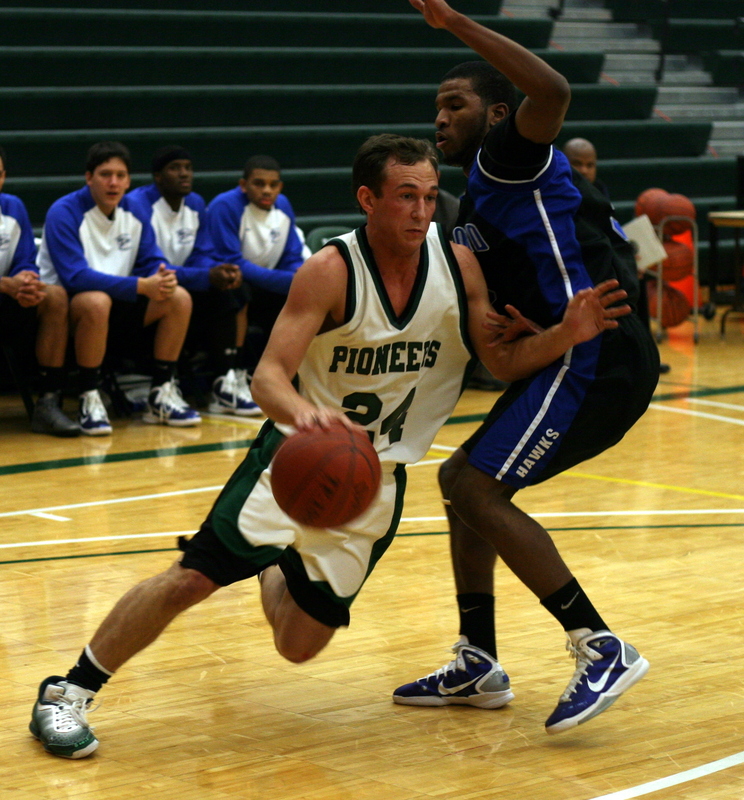 Delta College coach Lonnie Griffin drew up a perfect play as the Pioneers’ guards ran the clock down under 10 seconds. Freshman point guard A.J. Thomas drove to the basket and hit a wide open Brad Norman for what could have been the game-winning basket. It didn’t fall and Norman was called for a foul on sophomore forward Terrance Tubbs.